Wot oh, pip-pip and all that. An evening with Jeeves and Wooster isn’t going to be Ibsen, although the Norwegian playwright does get a name check in Perfect Nonsense, the West End adaptation of P.G Wodehouse’s The Code of the Woosters. What you do get instead of chin-stroking meaning-of-life musings is an evening of theatrical frivolity with lots of high jinks, jolly japes, some super-charged acting and plenty of hearty chuckles. Stephen Mangan (Wooster) and Matthew Macfadyen (Jeeves) are nearing the end of their six month (six month!) West End run and only have a few weeks left before they hand the cow-shaped creamer (more on that later) over to Robert Webb and Mark Heap on 7 April. Their enthusiasm, or at least their enthusiasm for pretending to be enthusiastic, hasn’t dipped which is no mean feat as this is a whirlwind of a production. 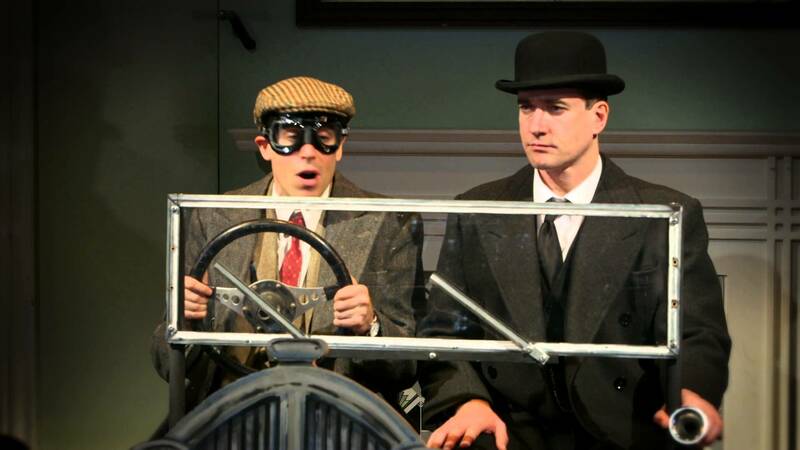 The Goodale Brother’s script nimbly works in many of Wodehouse’s cunningly complex tongue-twisting dialogue while Sean Foley’s direction sets a relentless pace; the script requires as much verbal gymnastics as the physical demands involve bodily acrobatics. Like Wodehouse’s novels, all the best farces and blondes (I can say that, I am – *ahem* – one) Perfect Nonsense is far cleverer than its silliness implies with a lot of gentle poking fun at the expense of theatre, exposing the absurdity and artifice of stage. The conceit is that Jeeves is performing a one-man-show dramatising his recent high-jinks with a cow-shaped creamer that takes him from a Chelsea antique’s dealer to Totleigh Towers, the home of the bombastic Sir Watkyn Bassett. Perfect Nonsense opens on a bare stage where Wooster is enthusiastically breaking down the fourth wall and filling the audience in on the story behind his theatrical debut. Bertie’s attempt to re-tell his adventures single-handedly soon runs into trouble, but, as ever, Jeeves has solved the problem before Bertie even knows he had one, gamely agreeing to play several of the characters himself and roping in Wooster’s Aunt Dahlia’s butler Seppings (Mark Hatfield) to act the rest, a role that means impersonating everyone from an imposing dictator to Bertie’s even more imposing aunt. There are plenty of Wodehouse’s fine words in the Goodale Brothers’ adaption to ensure a buoyant script, but the actors are still required to walk a fine line between a play that could be toe-curlingly daft or wonderfully silly. Fortunately, Mangan, Macfadyen and Hadfield all inhabit their many roles on the right side of the farce fence. Matthew Macfadyen, an actor I have previously found as a charming as a wet sock was never going to win me over as that pompous old stick Jeeves. But he revealed the great actor I never realised he was with his fantastic performances as ‘Jeeves’. The part when he’s simultaneously both Sir Watkyn Bassett and his niece Stiffy Byng is as fine a piece of comic acting as I’ve seen this side of the Old Vic’s 2011 Noises Off. Jeeves and Wooster in Perfect Nonsense is a deftly daft, big brained comedy that will leave you feeling pretty tickety boo, old chap. For tickets and more information on Jeeves and Wooster in Perfect Nonsense at the Duke of York visit www.jeevesandwoostertheplay.com. This entry was tagged comedy, Duke of York theatre, farce, Jeeves and Wooster, Jeeves and Wooster a perfect nonsense, London theatre, Mark Hadfield, Matthew Macfadyen, PG Wodehouse, Sean Foley, Stephen Mangan, The Goodale Brother, Theatre, theatre review. Bookmark the permalink.